A fundamental challenge of modern biology is to understand how information encoded in the genes of organisms translates into physiological and biogeochemical processes manifested from ecosystem to global scales. A parallel challenge of earth system sciences is to understand how earth systems will respond to climate change. These grand challenges intersect at the need to understand the global carbon cycle, which is both mediated by biological processes and is a key driver of climate through the greenhouse gases carbon dioxide (CO2) and methane (CH4). Three sequential U.S. Department of Energy-funded (Genomic Science Program) projects* focus on understanding the biological and earth system science aspects of CO2 and CH4 cycling at “the leading edge of global change” – a subarctic wetland system where climate change-induced permafrost melt is transforming methane sinks into sources. Our research goals are: (1) to discover functional relations for scaling microbial community composition and metabolism to the ecosystem biogeochemistry of CO2 and CH4; (2) to learn how these relations are affected by shifting climate, hydrology, and vegetation, and (3) apply this knowledge to better understand and predict changing carbon budgets (especially the fate of old versus new carbon) in subarctic ecosystems already experiencing climate change. 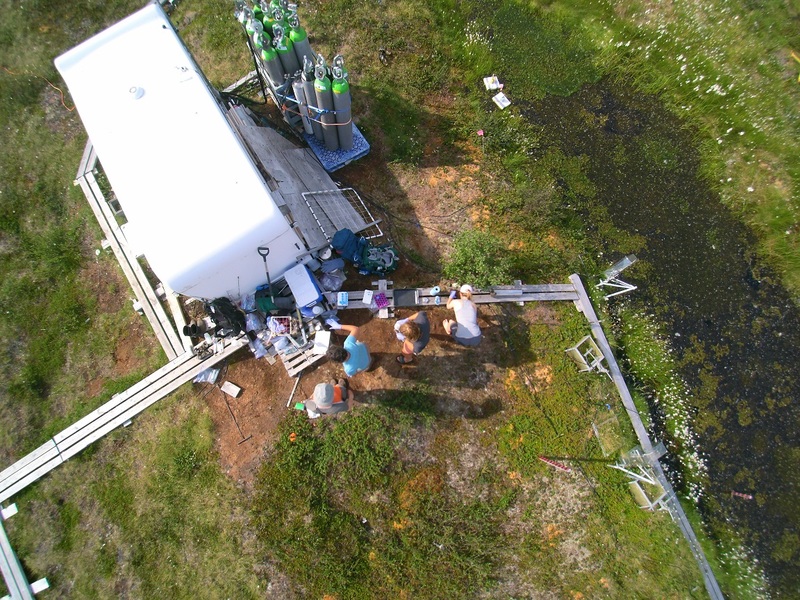 To achieve these goals we focus high-resolution, cutting-edge microbial and biogeochemical investigations across in situ permafrost thaw gradient and the adjacent post-glacial lakes. Our results are being integrated into ecosystem process models that predict greenhouse gas emissions, and the lessons are being generalized for inclusion in global climate models that currently do not include, or poorly characterize, permafrost thaw. Through this work, we address how permafrost thaw affects carbon cycling, predict the likelihood and magnitude of global warming feedbacks, and add a mechanistic framework for scaling from “genes to ecosystems” in this biome.